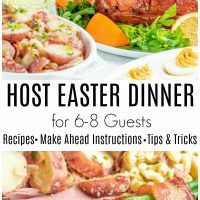 How to Host Easter Dinner for 6-8 People - Home. Made. Interest. 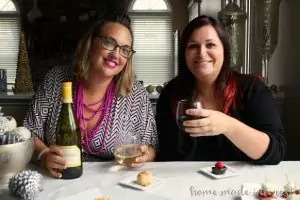 How to Host Easter Dinner from start to finish. A full Easter menu with recipes, make ahead instructions, and serving suggestions. Everything you need to make hosting Easter dinner easy! If you’re hosting Easter dinner this year we’re here to help. We have a complete Easter menu for you filled with some classic Easter recipes. 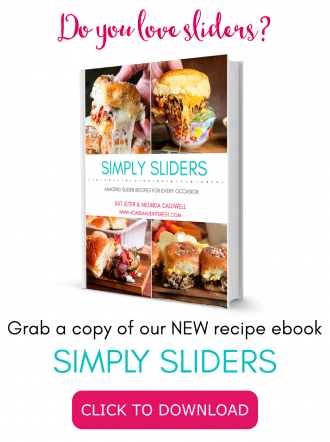 Along with each recipe we’re telling you what you’ll need to make the recipe, give you instructions for making the recipe ahead of time, and suggestions for serving each dish. It’s everything you need to host a beautiful Easter dinner without all of the stress! Let’s start with the menu. 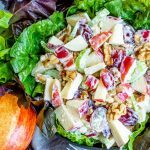 When you’re feeding a big group of people the key is to plan a meal that includes a few dishes that can be served cold or at room temperature. That way you don’t have to worry about cooking 5 different dishes in the oven, which is pretty handy if you’re like me and only have one oven! Serving a few cold, or room temperature dishes also means you can get them done ahead of time so you have less to do on the big day. 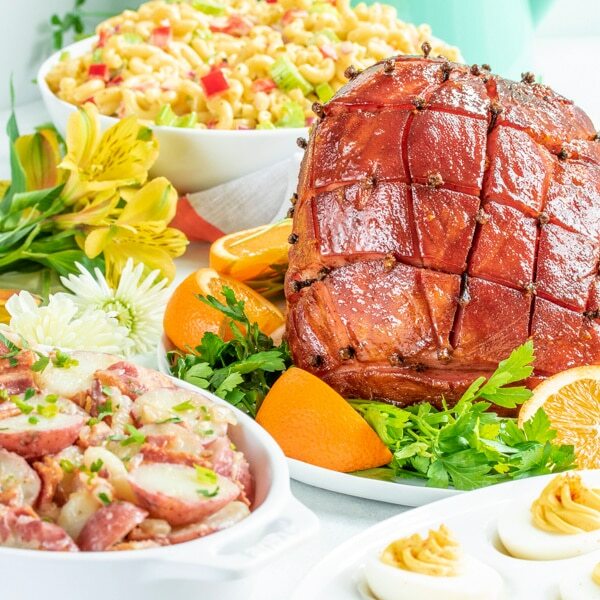 We’ve planned a complete Easter dinner menu from appetizer to dessert and we’ve broken each recipe down into what items you’ll need to make it, what you can do ahead of time, and suggestions on how to serve it including serving dishes and garnishes. Large Pot: You’ll need a pot large enough to boil a dozen eggs, covering them with 1-2 inches of water. A standard 8 quart stock pot with a lid should do the trick. Piping Bag: Using a piping bag makes it super easy to stuff all of those eggs, and to make them pretty! If you want you can even buy disposable piping bags so you don’t have to clean up afterwards! Piping Tip: If you want to get fancy and impress your guests add a star tip to your piping bag for a beautiful swirl effect like the one in the picture above. Up to 3 days ahead of time: Boil and peel the eggs. Store in an airtight container in the refrigerator. 1 day before: Slice eggs in half and remove yolks. Follow recipe instructions to make the filling for the eggs. Store eggs halves in an air tight container and the filling in a separate airtight container. Keep both refrigerated until ready to fill. Day of the event: Place the filling in the piping bag and fill the eggs halves. Place in an airtight container until ready to serve. 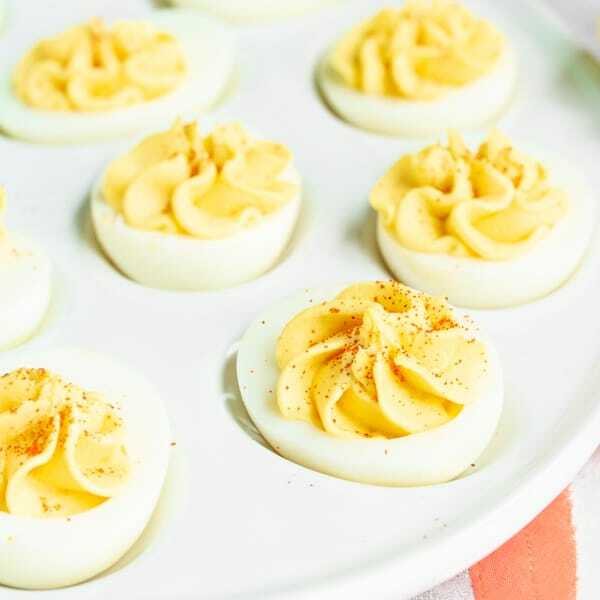 You can serve deviled eggs on a cute deviled egg platter or a large flat plate. Make sure to sprinkle with paprika right before serving. Roasting Pan: You can use a glass casserole dish, or a metal roasting pan. I love my roasting pan because it has a rack so the juices fall through as the ham bakes. Whatever pan you choose make sure it is deep enough that the juices won’t run out while the ham is baking! Aluminum Foil: The key to a good ham is keeping it nice and moist so you want to bake it covered for the majority of the time. I use aluminum foil for mine but you can also you an oven bag if you prefer. Basting Brush: For the glaze! I prefer a natural bristle brush but you can also use a silicone basting brush if you prefer (they are easier to clean!). 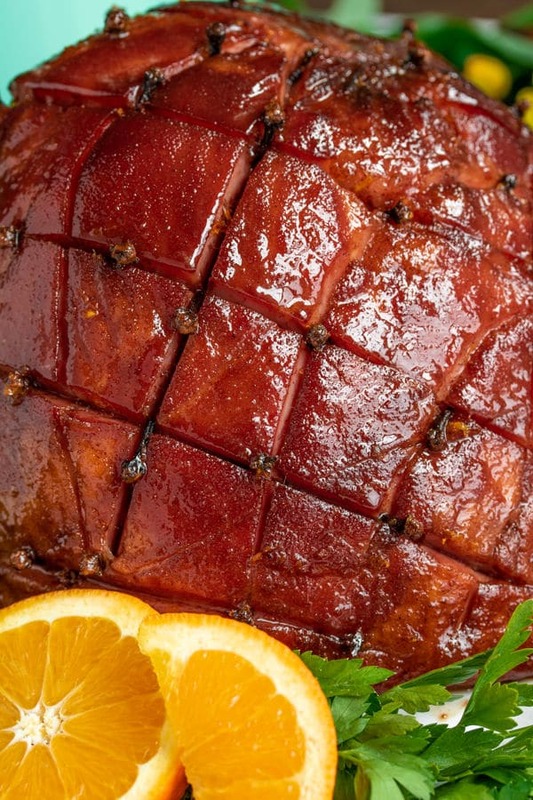 The ham is already fully-cooked so all you have to do is warm it through and boost the flavor with an easy homemade ham glaze. 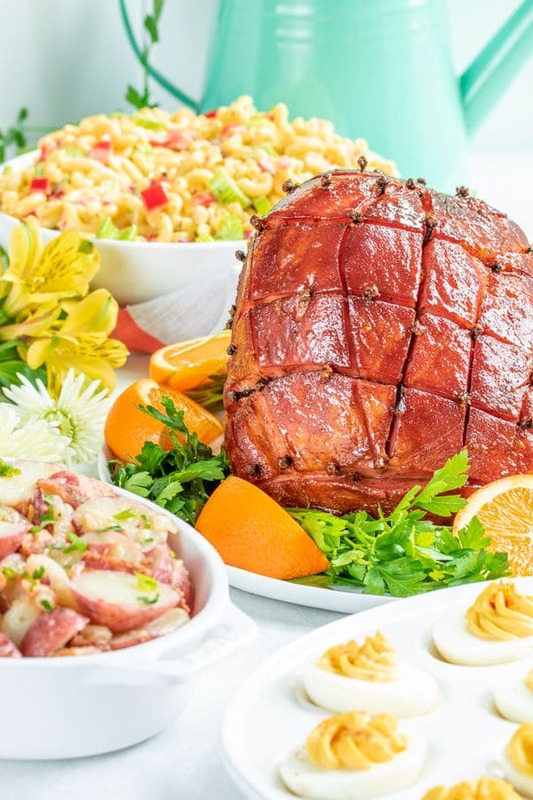 A ham needs approximately 15 minutes per pound to heat all the way through so you’ll want to time this to come out of the oven about 30 minutes before you want to serve dinner. That leaves you enough time to put the bacon wrapped green beans in the oven and slice your ham. The ham can sit covered in aluminum foil to keep it warm until you are ready to serve. 1 day before: Mix all of the glaze ingredients together and store in the refrigerator. Day of the event: Score the ham in a diamond pattern and add the cloves. Heat the glaze up and use as detailed in the recipe. You’ll need a large platter and a serving fork for your ham. 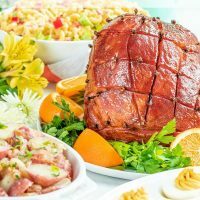 You can place the ham on the platter whole and slice at the table or you can slice it before placing it on the table which makes it easier for guests to serve themselves. Whichever way you choose to do it make sure to remove the cloves before slicing. Garnish with parsley and fresh sliced oranges around the outer edge of the platter. 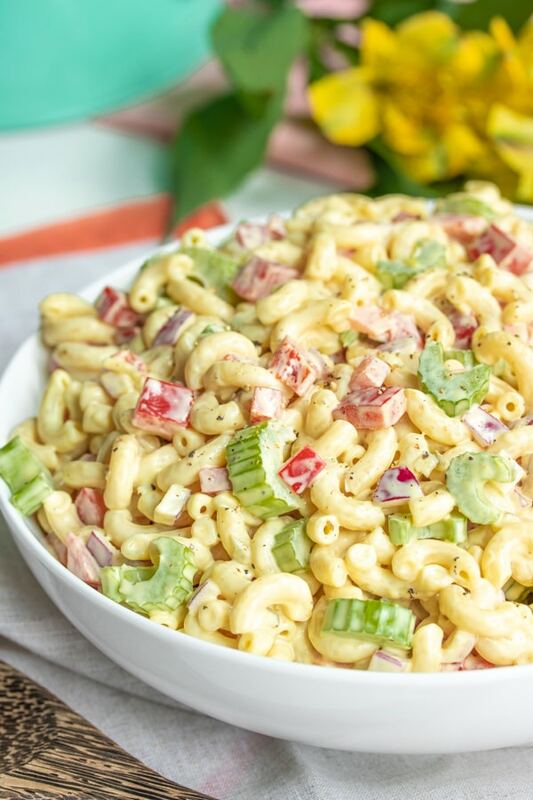 This macaroni salad is served cold and it’s super simple to throw together. All you need is a large bowl with a lid so you can toss all of the ingredients together, put the lid on, and store it in the refrigerator until you’re ready to serve. 1-2 days before: Make the macaroni salad and store in an airtight container in the refrigerator. Place the macaroni salad in a pretty bowl with a big serving spoon and you’re ready to serve. Large Pot: You’ll need a pot large enough to boil small red potatoes. The same 8 quart stock pot with a lid you used for the deviled eggs will work. Large skillet: You’ll be heating everything together and tossing it in a delicious dressing so you’ll need a skillet big enough to hold everything. I suggest a 5 quart saute pan with a lid. Boil the potatoes until they are fork tender. Let cool completely and then store in the refrigerator. Do not cut or peel. Cook the bacon. Reserve 1/4 cup of bacon grease. Let the bacon cool completely and store in an airtight container in the refrigerator. Store bacon grease in a covered container on the counter. Dice onion and store in an airtight container in the refrigerator. Day of the event: Take the potatoes out of the refrigerator in the morning and let them come to room temperature (at least 2 hours). Cut the potatoes into slices as instructed in the recipe and follow the recipe instructions to complete cooking the dish. You make need to cook everything a few minutes longer to warm the potatoes through. 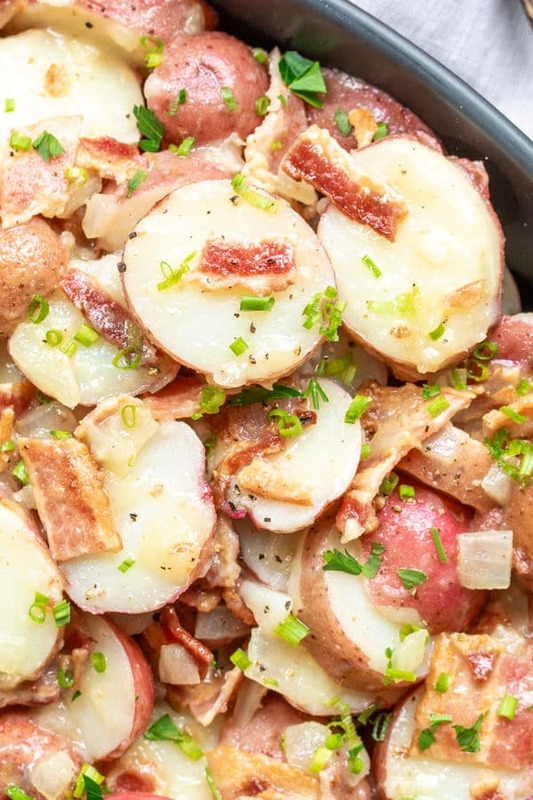 Serve the warm potato salad in a large bowl with a large spoon. Garnish with parsley and chives for added color. 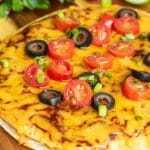 Baking Sheet: A large baking sheet with a lip around the edge to keep any juices from dripping off of the sides. Toothpicks: You’ll need these to hold your bacon in place as the green bean bundles cook. 1-2 days ahead: Partially cook your bacon. You want the bacon to be cooked to the point that it is beginning to crisp up but can still be wrapped around the green beans. Store in an airtight container in the refrigerator. 1 day ahead: Par cook the green beans boiling them in a large pot of salted water until they are tender but crisp. Once cooked run them under cold water to stop the cooking process. Pat dry and let them cool completely. Store in an airtight container in the refrigerator. 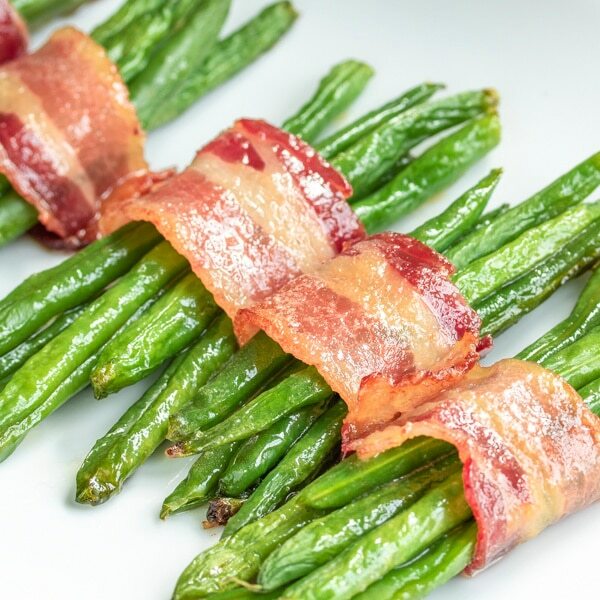 Day of the event: Wrap the green beans in bacon and place on a baking sheet. Prepare the brown sugar glaze. 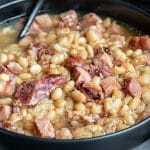 Set aside until the ham comes out of the oven then follow the recipe for cooking instructions. 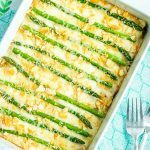 Serve green bean bundles on an oblong or rectangular dish with tongs or a large fork for serving. Mixer: I use my Kitchen Aid stand mixer with the paddle attachment but you can also use a hand mixer. Cake Pans: Three 9-inch cake pans are needed for making this 3 layer cake. There are instructions for making a 2 layer cake if you prefer just check the recipe notes. Parchment Paper: Use this to line the bottoms of your cake pans. Then you never have to worry about about it sticking! Up to 2 weeks ahead of time: Yep, that’s right! You can make this cake 2 weeks ahead of time and keep it in the freezer. 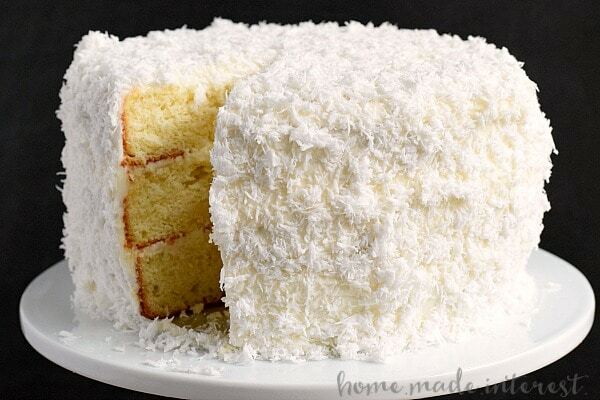 Bake, assemble, frost, and top with coconut. Then you wrap the cake with a couple of layers of plastic wrap and then wrap with a couple of layers of aluminum foil. Store in the freezer. Day of the Event: Remove the cake from the freezer in the morning. Unwrap and place on your cake stand and leave it out on the counter to thaw out (at least 4 hours). Place the cake on a beautiful cake stand or a large, flat platter. Have a cake stand for serving our cake. That’s it guys! 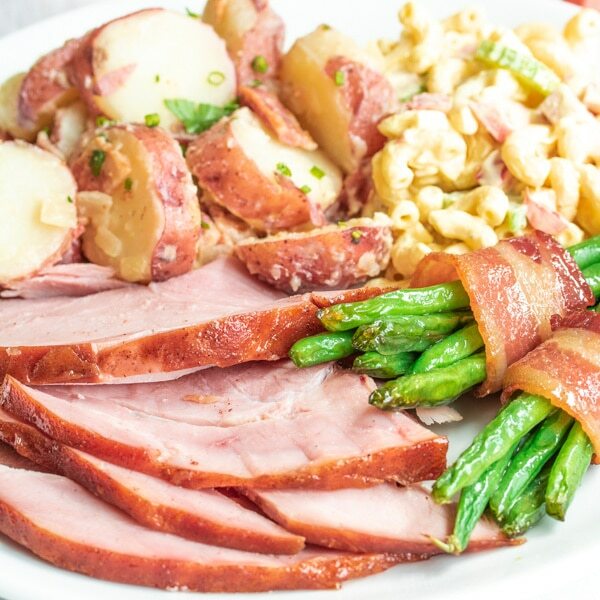 Everything you need to serve Easter dinner from start to finish. I hope you have a wonderful holiday with friends and family. Let us know how your Easter dinner goes in the comments. Like this recipe? Pin it to your Easter board!